NEXT | Do you prefer big changes to be made gradually or all at once? The Zandalari were the first Troll empire to rise. Even after the other tribes left the mountain of Zandalar to establish their own nations the Zandalar had a special status among Trolls. They held the holy mountain and were closest to the Loa, the Wild Gods who spoke to their people. After the alliance with the Mogu was rendered less than tenable following the Mogu defeat by the Pandaren, the Zandalar were unprepared for what would happen next. A new power was rising in the land while they focused on the Mogu and their dealings in the south. It was a power to the north, along the shores of the Well of Eternity. The Dark Trolls never acknowledged the Zandalari or the Loa. Rather than settle at the holy mountain of Zandalar, they found another holy mountain to the north. On the massive Mount Hyjal, they made allies with the Wild Gods that slept on the slopes. Before the Amani or Gurubashi left to found their empires, the Dark Trolls were seeking a more peaceful connection to the natural world. They allied with Dryads and other creatures of the wild. Eventually, they settled amidst the groves surrounding the Well of Eternity. Many of the Dark Trolls would continue in these ways for tens of thousands of years. But long before the Zandalar made their deal with the Mogu, one tribe found the Well of Eternity, and were forever changed by it. The Temple of Elune, clearly a Titan structure dating back to the ordering of the world, contains tantalizing clues as to the original meeting of the Dark Trolls and the Goddess who would change their world forever. After generations living along its shores, the Dark Trolls that discovered the Well were Trolls no longer. 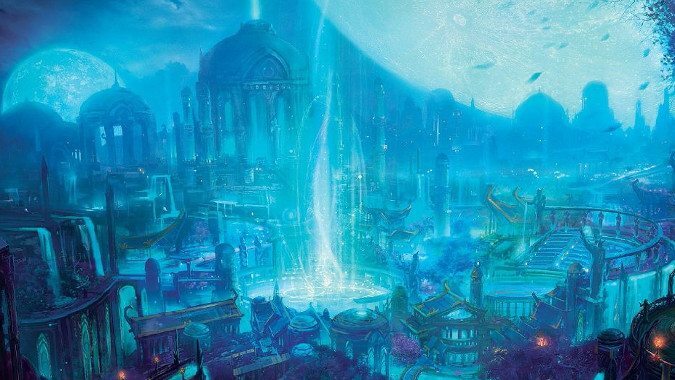 Centuries passed as these Kaldorei — Children of the Stars, a word taken from Titan relics they discovered alongside the Temple of Elune — defined themselves by their mastery of the Well’s potent arcane energies. They began to spread outward from the Well, claiming Hyjal and other regions. Rather than displace the Dark Trolls, they allowed their forebears to simply inhabit the deep tunnels as they always had. But other Trolls were not so fortunate. The Zandalar, fresh from their loss to the Pandaren, were no match for the Kaldorei in battle. The Night Elves, were not interested in the holy mountain of Zandalar. They had their own holy mountain, after all, and their own Wild Gods. The Loa were not important to them. But Trolls everywhere were pushed back away from the Well of Eternity. The Amani and Gurubashi, the Drakkari and Farakki all felt the sting of the Kaldorei’s new magics. The Zandalari lost battles against them too. While the Night Elves didn’t seek control of Zandalar itself, many of the northern holdings of the Trolls were taken from them in astonishingly punishing defeats for the Trolls who’d once mastered the world. The Kaldorei were now the undisputed masters of any part of Kalimdor — a word they gave to the land they lived on — they cared to claim. Unable to do more than watch, the Zandalar were as threatened as anyone when the Burning Legion erupted through the portal above the Well. They chose to defend their own rather than aid their ancient enemies, however. When the Sundering finally happened, the Zandalar managed to shield the holy mountain and as much of their territory as they could. They were amazed to discover themselves surrounded by ocean. Their faith in the Loa seemed to have paid off. Zandalar Isle now endured in protected isolation from the rest of the world, and the Zandalari saw no reason to leave it. Instead, they chose to master their new world. 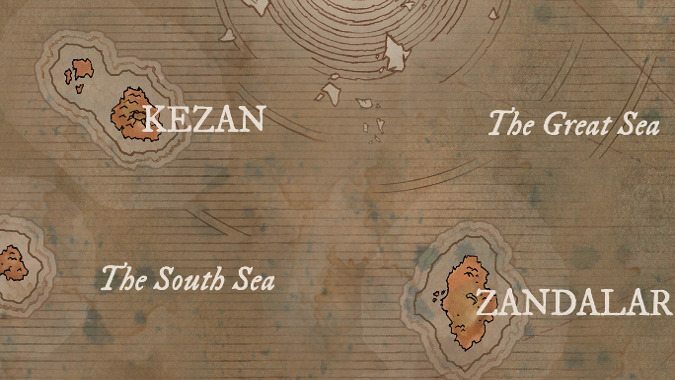 One of the islands the Zandalari encountered was Kezan, home of a strange race of primitives we call Goblins today. Finding a magical mineral called Kaja’mite on Kezan, the Trolls decided that mining it was too much work. They forced the Goblins to mine it for them. The Zandalari knew the mineral was potent — they used it in rituals to their Loa. But when the Goblins rose in rebellion, they washed their hands of the troublesome place and the magic mineral both as too much trouble. The Zandalari may have been influenced by having watched the Mogu fall in a slave revolt. Alternatively, they may have been wary of the cost of Kaja’mite addiction that soon held the Goblins in its thrall. But another threat, and one far more insidious, was soon to arise. By this point following the Sundering, the Zandalari had become a kind of revered ‘sacred’ tribe among the other Trolls. Neither the Amani nor the Gurubashi were the powers they’d once been. Both Zul’Drak and Zul’Farrak accepted Zandalari as religious leaders. Their proximity to the Loa made them essentially the bond that all Trolls recognized. A diplomatic and theological bridge they could all walk — until the coming of Hakkar. The Gurubashi, long in decline following the Sundering, managed to begin rising again around 1500 years before the Dark Portal would open. When the Zandalar observed this, and saw the Gurubashi conquering land that they’d long since lost, they were interested in how. Eventually, they discovered that their former cousins were consorting with one of the Loa. A Loa so dark that even Bwonsamdi the Loa of Death sought no truck with it, a creature that consorted with Nightmare. This Loa called itself the Blood God, and the Atal’ai tribe were his priests. The Blood God cared nothing for the Gurubashi. However, the slaughter they practiced in his name pleased and empowered him. He demanded more carnage, more bloodletting, and even blood sacrifices as he fed on the blood shed in his name. Soon the Gurubashi were drunk on mayhem, rejecting the advice of their Zandalari cousins. 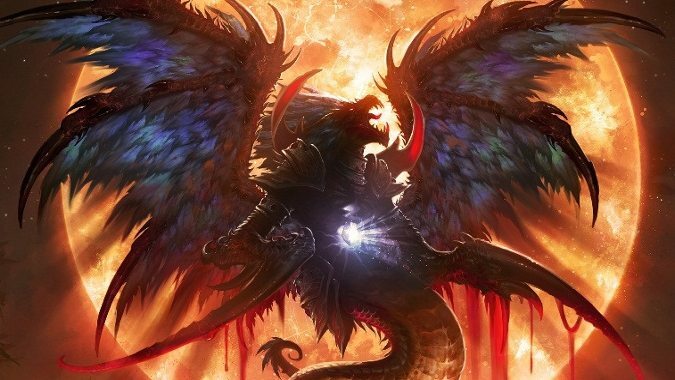 The Blood God demanded feeding, and with his blood empowering them, they would rise as the destined masters of the world. The Zandalari had no love for the other races of Azeroth. But they didn’t wish to end up on Hakkar’s altars, either. They raised a mighty army, and taught the Gurubashi that the Zandalari reticence to stop them from leaving years before hadn’t been due to a lack of ability. Many of the Gurubashi tribes were just as tired of Hakkar and his ceaseless demands for their blood as anyone. They chose to ally with their Zandalari elders. Together, they defeated the Atal’ai and Hakkar, driving them from Zul’Gurub. The Atal’ai fled into the swamps to the north where they built a temple to Hakkar. As for the Gurubashi Empire, it died in civil war. The Zandalari were content to return to their islands. The Goblins had rebelled and been abandoned, and now the Zandalari left the Gurubashi to their own fratricidal ambitions. Ruling the other Trolls was never in their designs. When the Trolls of Azeroth realized the Zandalari were right, they would come to them. And for the next 1500 or so years, this is how things would remain. 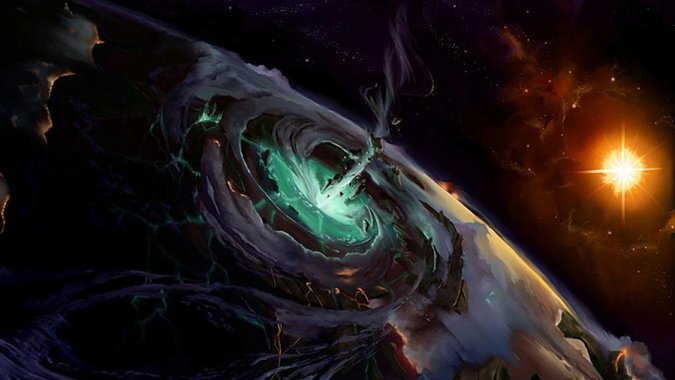 Eventually, the opening of the Dark Portal changed the entire world. 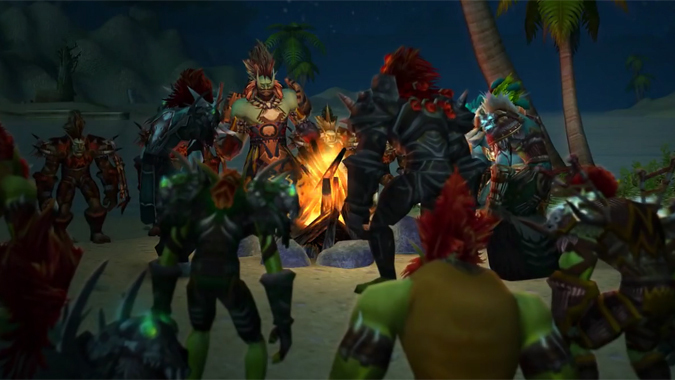 Even the Zandalari couldn’t ignore how this event would change them. But that’s a story for another time.